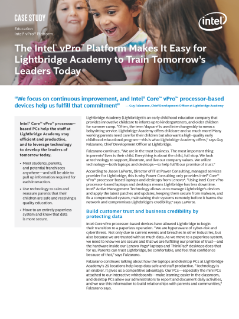 PCs built on the Intel® vPro™ platform help staff at Lightbridge Academy leverage technology to develop the leaders of tomorrow. Staff can meet students, parents, and potential franchisees anywhere—and still access information for interactions. They use Intel® Core™ vPro™ processor-based laptops and desktops that help reduce downtime and be more productive. Intel® Active Management Technology ...help manage their devices and apply the latest patches and updates, keeping them secure from malware, and fix a compromised system, maintaining their systems remotely.